The holidays are around the corner, time for a new rug! At Area Rug Dimensions, we are experienced in interior design and we are proud to be able to say that we have helped 100’s of homeowners throughout Kansas City, Overland Park, and Leawood areas choose the perfect area rug. If you have your own interior designer, we are very good at working hand-in-hand with them and the direction they are going with your home’s interior. We make ourselves an asset and augment their efforts. We’ll help you select just the right rug, whether it is to be an Oriental Rug, Transitional Rug, Modern Rug, or Antique Persian Rug. We know that a well selected area rug in the right color and pattern is as important to the overall design as paint, drapes and furniture, and through our help in your planning, you can be assured of a choice rug you’ll be satisfied with for years to come. Some people like to make their own design choices and we always encourage you to make your rug choice something that’s very personal to your tastes and lifestyle as well as the overall design of your room. Here you’ll find some design tips that we’ve learned during the many years we’ve been in the area rug business. 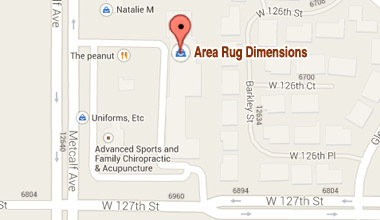 We’re always available to help you if you have any questions once you start your area rug search. Feel free to contact us and we’ll get started helping you find that rug with just the right colors, size, and design. One of the first decisions you need to make is how large an area rug to buy. Obviously, the size and shape of the room will govern how large a rug you’ll want, however, the room’s use, the placement of furniture, the condition of the floor beneath, and the amount of light will also be important considerations. Some designers will draw a diagram of the room to scale with the furniture in position to determine the prime size of the rug and how it will be positioned. When choosing a rug for a dining room for example, you’ll want to make sure that the rug is large enough so that when the chairs around the dining room table are pulled back to take your seat, the chairs are still on the rug. Otherwise, your guests will have trouble pulling their chairs forward without catching the legs on the edge of the rug. If you have a beautiful wood floor in an entryway or den, you may want to size the rug so that more of the floor shows. Some say that you should leave at least three to four feet of floor showing around the area rug. In situations where you have large or bulky furniture, like a couch, you can help with the overall balance by making sure the rug is large enough that the front legs of the couch rest on the rug. As a general rule, the larger the area rug you can buy the better. You will be pleased with the color and design, and the larger rug usually makes your interior look its best. Contact us .. we are good at helping you with this! The color of your new area rug is one of the most personal and subjective elements of the buying process. Certain colors can invoke emotional feelings. Bright colors like red or orange can stimulate whereas cooler colors like blue or purple can relax. In your search, you’ll notice new styles with beautiful shades of grey, silver and lavender as well as black, gold and rich smoky blues. Color combinations can really be fun, if you are prepared and plan ahead. When making color decisions, we generally recommend making the area rug decision first, before the other aspects of the room are selected. Once you decide on the oriental rug, then the wall color, window treatment, fabrics and furnishings can fall into place. However, in cases where this is not possible, paint samples, fabric swatches, pillows and furniture styles will all be needed with you as you look at different rugs. If you have fairly neutral colors in these samples, then a bolder color for the area rug will probably work well. We always strive to find “ready-made” rugs with your colors but in any case were that is not possible we do custom rugs very well and make that process easy for you. Contact us .. and visit us in our Gallery Style Showroom at 127th and Metcalf Avenue Overland Park, KS… we are good at coordinating colors! Designing with pattern requires thought and planning. It probably wouldn’t work to create a space where the rug, walls and fabric in the room all have different wild designs competing with each other. Patterns should work in harmony. Practically speaking, the right pattern can hide a multitude of spills, spots and wear. Even a subtle pattern, created by varying textures for example, will help to conceal blemishes. Pattern adds detail to a room, whether it’s geometric, floral or a simple check. It also brings character and complexity to the overall design. If there’s a primary fabric in a room that has a big bold print, then consider a simple pattern, such as a check or diamond, for the rug. Scale must be considered as well. If an area rug has a large scale pattern, , other patterns in the room should probably be smaller. In contrast, if the oriental rug has a floral design, it’s a good idea to steer away from competing floral patterns in the room and consider small prints, stripes and solids for furniture and window treatments. Some patterns complement certain furniture styles. Geometric patterns, for example, are often used in the Art Deco style, whereas a formal, traditional room will have an oriental rug with a classic, decorative pattern. In a room with modern furniture, a contemporary rug which is simple and contains clean lines will enhance the overall look. Contact us .. and browse our complete selection at our store serving the Kansas City Metro Area, we are good at coordinating colors and patterns! Most often, what material you choose for your area rug is not a consideration and it certainly should be. The material the rug is made from and its method of construction, will determine how well the rug performs over time. This has a significant effect not only on the price you pay, but also your overall satisfaction with your purchase. Taking the time now to understand how rugs are made and the materials used will go a long way to helping you make a sound decision. 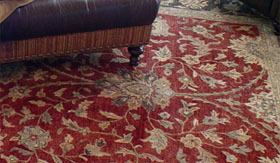 The area in which you intend to place your area rug will determine the importance of durability. A high traffic area needs a long-wearing, stain resistant fiber, while your bedroom may require only something that is soft to the touch and pleasing to the eye. Let’s look first at the materials used in area rugs. For centuries, wool has been synonymous with quality and taste. Wool products are prized for their ability to take and retain color, the softness of the fibers and for the overall ability to maintain its original look for a longer period of time. Wool is easy to keep clean due to its natural barriers against dirt and dust. This natural fiber purifies air quality by absorbing common contaminants and not emitting them into the environment. It resists combustion, making it fire resistant. Even burns from cigarettes or hot embers do not permanently mar wool. It is a biodegradable product and environmentally friendly. Wool absorbs sound, making it acoustically advantageous. Wool is water repellant, making spills easier to clean up. Wool saves on heating costs because of its inherent thermal properties. Wool maintains long-term appearance retention due to its natural resilience. Although wool was once thought of as a very expensive, high-end rug manufacturers have developed some wool area rugs that wear extremely well and are a terrific value. Cotton: Softer than wool but less durable, cotton is available in a variety of colors. Silk: Although quite beautiful, silk is very expensive and not as strong as wool so it’s use is generally blended with other materials for colorful accents. Jute: The softest of all natural fibers. When exposed to direct sunlight, jute may fade or darken in color. With prolonged exposure to moisture, the fiber disintegrates. Sisal: Stronger and more durable than any natural rug fiber. Since sisal is static-free and colorfast, it’s perfect for just about any area. Blends: Two or more of these fibers combined in one rug. For many years there has been a fear to buy synthetic area rugs because they would not age well and could be difficult to clean if stained. Fortunately, rug manufacturers have improved the technology and synthetics are no longer the stepchildren of floor covering. 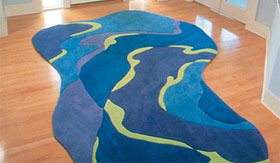 Innovative techniques have resulted in high quality rugs with lasting durability. One common synthetic fiber, nylon, resists soils and stains, making it a natural for high traffic areas. It is resilient and wears well and is often used in combination with natural fibers. If a solution-dyed nylon is used, the rug will be colorfast because the color was added during the making of the fiber itself. 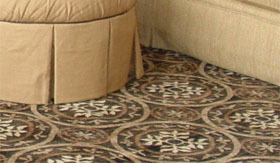 Polypropylene is another common synthetic fiber used in area rugs. It is the most stain-resistant synthetic fiber on the market today. Polypropylene repels water and is impervious to most stains. It is also usually less expensive than other fibers. Synthetic fiber manufactured rugs are a very good value, especially if your budget is tight. Beautiful, high quality area rugs constructed from man-made materials should be a consideration in your design options and can be a solid investment in the grace and elegance of your home. 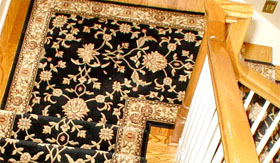 There are really just two kinds of construction used in creating area rugs: man-made and machine-made. Typically, a hand-woven area rug will carry a higher price tag due to the amount of labor involved, however there are high-end machine made rugs as well. With hand-woven rugs, it is important to determine the number of knots per square inch in the construction, and this is information that should be made readily available. The higher the knot density, the longer the area rug will last but also, the higher the price tag. With knot counts of 400 per square inch, which is rare, you can experience a rug lasting for 50 years or more. Some Persian rugs with a knot density of over 1,000 will last over 200 years! A real investment. Hand-Knotted: Each knot is individually tied by hand by a skilled weaver, creating a one-of-a-kind rug. These knots are single strands of yarn that have been looped around two adjacent warp threads. Hand-knotted rugs are very durable and can stand up to lots of traffic. You should expect at least 20 years or more in high traffic areas. Hand-Tufted: An inked-on foundation cloth is stretched over a loom. Then a manually operated hand-tufting gun pushes the yarn through the back of the cloth. When the rug is taken off the loom, a scrim and layer of latex is placed on the back. A backcloth is then sewed on to the latex and scrim to protect your floors. Hand-Hooked: The weaver pushes a hooking tool through the foundation cloth to the front of the rug, then pulls the yarn to the back, leaving a loop on the surface. Hand-hooked rugs often have very intricate or delicate patterns. Since there are no knots with this construction, a latex backing is used to hold the weave in place. This type of construction, although beautiful, doesn’t last as long and should be considered for low traffic areas. Technology has advanced with machine-made rugs in such a way as they are now a very good choice for many kinds of design applications. They can be made with either natural or synthetic fibers and can stand up to traffic. High quality rugs manufactured by reputable companies can provide beauty, elegance and longevity, and in most cases at extremely affordable prices. Wilton Loom: These rugs bear a close resemblance to hand-knotted rugs but are machine made. The pile is woven between two backings and then split down the middle so you get two separate rugs. Contact us .. whether it’s Oriental, Modern, Transitional, or Persian Rugs you’re looking for, we invite you into our Johnson County Kansas Showroom conveniently located at 127th and Metcalf, Overland Park, KS… let us SHOW you the differences!